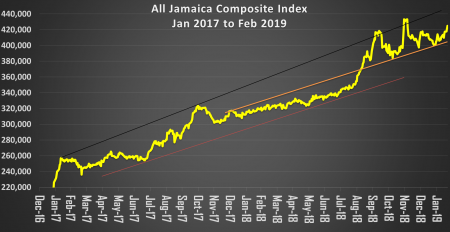 The main market of the Jamaica Stock Exchange made further gains at the end on Thursday with JSE All Jamaican Composite Index increasing by 791.14 points to 425,581.58 and the JSE Index advancing by 718.92 points to 387,730.67. At the close market activity, the main and US markets traded 36 securities, compared to 33 securities trading on Wednesday as 17 advanced, 6 declined and 13 traded without changes in prices. Main market activity ended with 10,610,997 units valued at $1,075,805,493 compared to 6,849,263 units valued $129,072,474, changing hands, on Wednesday. NCB Financial Group led trading with 7,060,926 shares for 66.5 percent of the day’s volume, JMMB Group 7.25% preference share was next with 950,000 units, accounting for 9 percent of the total main market volume changing hands and Wisynco Group ended with 549,686 shares for 5 percent of the day’s volume. An average of 321,545 units valued $32,600,166 compared with 228,309 units valued at an average of $4,302,416 for each security traded, on Wednesday. The average volume and value for the month to date, amounts to 318,948 shares with a value of $14,410,836 and previously, 318,762 shares with a value of $13,014,911. Trading for January resulted in an average of 101,980 units, valued at $3,042,494, for each security traded. IC bid-offer Indicator|The Investor’s Choice bid-offer indicator ended with the reading showing 7 stocks ending with bids higher than their last selling prices and 3 stocks closed with lower offers. In main market activity, Caribbean Cement rose 50 cents after exchanging 146,631 shares, to end at $51.50, Grace Kennedy lost $1.49 trading 40,883 stock units to end at $58.50, JMMB Group gained $1 trading of 81,877 shares, to close at $32.50, Kingston Wharves gained $1.20 to close at $77, with 2,079 units changing hands. NCB Financial added 29 cents to close at $144.79, with an exchange of 7,060,926 shares, PanJam Investment rose 89 cents to end at $76.99 in exchanging 880 shares, Sagicor Group rose $2 to settle at $42, with 133,288 shares changing hands, Salada Foods rose $1 trading 600 stock units to close at $36. Scotia Group lost 48 cents and ended trading of 14,123 stock units at $53.45, Seprod fell $2 trading 323,011 shares at $45, Sygnus Credit Investments gained 50 cents with 112,100 units trading to end at $13.50 and Wisynco Group rose 30 cents and settled at $11.85, with 549,686 shares changing hands. Trading in the US dollar market resulted in 135,456 units valued at over $24,597 changing hands. Margaritaville completed trading 4,150 shares at 24 US cents, Proven Investments lost 1.5 cents in trading 100,406 units, to close at 20.5 US cents and Sterling Investments traded 10,000 units at 0.0385 US cents. The JSE USD Equities Index advanced 0.16 points to close at 168.96. Caribbean Cement an IC Insider.com TOP 10 BUY RATED stock jumped a sharp $7.99 to close at $51 in response to the company reporting a big 122 percent jump in profit for 2018 over 2017. Profit after tax moved from $1.11 billion in 2017 to $2.47 billion from an increase in revenues of just 6.4 percent, to $17.57 billion. 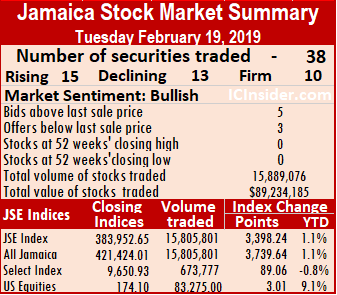 The main market of the Jamaica Stock Exchange ended with JSE All Jamaican Composite Index climbing 3,366.43 points to 424,790.44 and the JSE Index advancing 3,059.10 points to close at 387,011.75. At the close market activity, the main and US markets traded 33 securities, compared to 38 securities trading on Tuesday, 9 advanced, 13 declined and 11 traded with unchanged prices. Main market activity ended with 6,849,263 units valued $129,072,474, compared to 15,805,801 units valued at $87,341,139 changing hands, on Tuesday. An average of 228,309 units valued at an average of $4,302,416 for each security traded, in contrast to 451,594 units valued at an average of $2,495,461 on Tuesday. The average volume and value for the month to date, amounts to 318,762 shares with a value of $13,014,911 and previously, 325,058 shares with a value of $13,668,348. Trading for January resulted in an average of 101,980 units, valued at $3,042,494, for each security traded. JMMB Group 7.25% preference share led trading with 1,863,840 shares for 27 percent of the day’s volume, JMMB Group ordinary share was next with 1,588,456 shares, accounting for 23 percent of the total main market volume changing hands and Wisynco Group ended with 548,081 shares, for 8 percent of the day’s volume. In main market activity, Barita Investments gained 49 cents trading 71,190 shares, to close at $48.50, Berger Paints rose 50 cents to end at $20, with an exchange of 1,387 stock units, Caribbean Cement exchanged 347,372 shares, to end at $51 after jumping $7.99. Grace Kennedy traded 24,003 stock units and rose 99 cents to end at $59.99, Kingston Wharves dropped $1.20 to close at $75.80, with 6,198 units changing hands, NCB Financial lost 45 cents to close at $144.50, with an exchange of 118,906 shares. PanJam Investment fell 89 cents to end at $76.10, exchanging 16,747 shares, Scotia Group gained 93 cents and ended trading of 22,820 stock units, at $53.93 and Seprod rose $1 trading 174,703 shares at $47. Trading in the US dollar market resulted in 2,032,362 units valued US$237,397 changing hands. Proven Investments traded 54,975 units, with the price closing at 22 US cents, Sterling Investments traded 10,000 units at 0.0385 US cents and Sygnus Credit Investments ended with 18,300 units trading unchanged at 9 US cents. The JSE USD Equities Index lost 5.30 points to close at 168.80. Seprod jumped $7.01 to close at $46. Seprod an IC Insider.com Stock to Watch, for the week, jumped a sharp $7.01 to close at $46 after hitting $47 during the trading session, in trading 69,936 shares, in response to the company reporting a big jump in profit for 2018. Profit after tax moved from $735 million in 2017 to $1.276 billion from an increase in revenues of 48 percent to $24.4 billion with profit rising over 2,000 percent to $304 million in the December quarter, from a doubling in revenues. 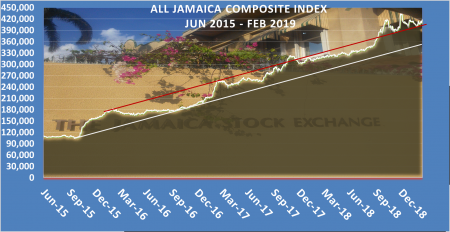 Trading on the main market of the Jamaica Stock Exchange ended as JSE All Jamaican Composite Index increased by 3,739.64 points to 421,424.01 and the JSE Index advanced 3,398.24 points to 383,952.65. At the close market activity, the main and US markets traded 38 securities, compared to 34 securities trading on Monday, with 15 advanced, 13 declined and 10 traded with prices unchanged. Main market activity ended with, 15,805,801 units valued at $87,341,139 compared to 4,631,898 units valued $132,673,939 changing hands, on Monday. An average of 451,594 units valued at an average of $2,495,461 for each security traded. In contrast to 149,416 units for an average of $4,279,804 on Monday. The average volume and value for the month to date, amounts to 325,058 shares with a value of $13,668,348 and previously, 313,874 shares with a value of $14,739,721. Trading for January resulted in an average of 101,980 units, valued at $3,042,494, for each security traded. 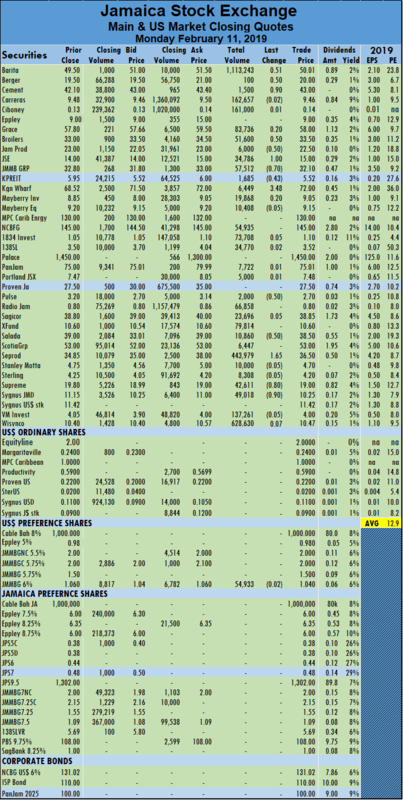 JMMB Group 7.25% preference share led trading with 11,919,446 shares for 75.4 percent of the day’s volume, Pulse Investments was next with 901,239 shares, accounting for 5.7 percent of the total main market volume changing hands and Ciboney ended with 607,166 shares, for 3.8 percent of the day’s volume. IC bid-offer Indicator|The Investor’s Choice bid-offer indicator ended with the reading showing 4 stocks ending with bids higher than their last selling prices and 3 stocks closed with lower offers. In main market activity, Barita Investments declined by $1.49 trading 99,034 shares, to close at $48.01, Berger Paints fell 50 cents to end at $19.50, with an exchange of 4,506 stock units, Caribbean Cement exchanged 24,981 shares but fell 49 cents, to end at $43.01, Grace Kennedy traded 20,001 stock units with a fall of $1.99 to end at $59. 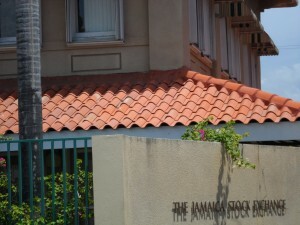 Jamaica Stock Exchange rose 35 cents to close at $17.50, with 134,109 shares trading. JMMB Group lost 25 cents trading of 82,352 shares at $31.75, Kingston Wharves jumped $1.90 to close at $77, with 1,112 units changing hands, Pulse Investments lost 25 cents to close at $2.90, with an exchange of 901,239 shares. Radio Jamaica rose 24 cents and settled at $1.24, with 366,704 shares, Sagicor Group climbed $1.50 and ended trading of 48,877 stock units at $40, Salada Foods jumped 57 cents trading 8,199 shares at $35, Stanley Motta rose 80 cents to end at $5, with an exchange of 5,850 shares. Sygnus Credit Investments gained 70 cents to end at $13 with an exchange of 24,206 shares and another Stock to Watch, Wisynco Group gained 80 cents and ended trading of 194,598 shares at $11.80. 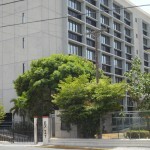 Trading in the US dollar market resulted in 83,275 units valued at US$14,233 units changing hands. 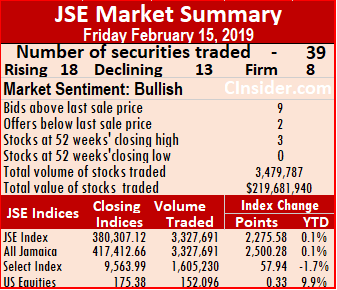 Proven Investments gained 1 cent in trading 54,975 units, with the price closing at 22 US cents, Sterling Investments traded 10,000 units at 0.0385 US cents and Sygnus Credit Investments ended with 18,300 units trading unchanged at 9 US cents. The JSE USD Equities Index advanced by 3.01 points to close at 174.10. 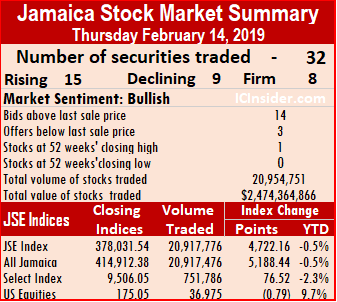 Trading on the main market of the Jamaica Stock Exchange ended on Monday with JSE All Jamaican Composite Index increasing 271.71 points to 417,684.37 and the JSE Index advancing by 247.29 points to 380,554.41. At the close market activity, the main and US markets traded 34 securities, compared to 39 securities trading on Friday, with 11 advanced, 11 declined and 12 traded firm. Main market activity ended with, 4,631,898 units valued $132,673,939 changing hands, compared to 3,327,691 units valued at over $215,403,267 on Friday. JMMB Group 7.50% preference share led trading with 1.5 million shares for 32 percent of the day’s volume, Grace Kennedy was next with 800,533 shares, accounting for 17 percent of the total main market volume changing hands and PANJAM Investment ended with 513,612 shares, for 11 percent of the day’s volume. IC bid-offer Indicator|The Investor’s Choice bid-offer indicator ended with the reading showing 9 stocks ending with bids higher than their last selling prices. There was no stock closing with a lower offer. An average of 149,416 units valued $4,279,804, in contrast to 97,873 units valued at $6,335,390 on Friday. The average volume and value for the month to date, amounts to 313,874 shares with a value of $14,739,721 and previously, 327,842 shares with a value of $15,710,552. Trading for January resulted in an average of 101,980 units, valued at $3,042,494, for each security traded. In main market activity, Caribbean Cement exchanged just 250 shares but rose 50 cents, to end at $43.50, Grace Kennedy traded 800,533 stock units with a gain of $2.49 to end at $60.99, Jamaica Producers rose 50 to close at $23, with 12,986 shares trading, Jamaica Stock Exchange fell 35 cents to close at $17.15, with 326,652 shares trading. JMMB Group rose 30 cents trading of 20,416 shares at $32, Kingston Wharves lost 90 cents to close at $75.10, with 5,100 units changing hands, Mayberry Investments added $1 and ended trading of 22,800 shares, at $9.05, Pulse Investments rose 35 cents to finish at $3.15, with an exchange of 7,396 shares. Salada Foods jumped $1.43 trading 750 shares at $34.43, Stanley Motta shed 47 cents to end at $4.20, with an exchange of 10,000 shares and Sygnus Credit Investments gained 80 cents to end at $12.30 with an exchange of 13,844 shares. Trading in the US dollar market resulted in 45,740 units valued at $5,803 changing hands. JMMB Group 6% preference share concluded trading of 1,300 units at $1.04, Margaritaville traded 1,000 shares at 24 US cents, Proven Investments fell 0.99 cent in trading 10,440 units, with the price closing at 21 US cents and Sygnus Credit Investments ended with 34,300 units trading at 9 US cents after falling 2 cents. The JSE USD Equities Index lost 4.29 points to close at 171.09. 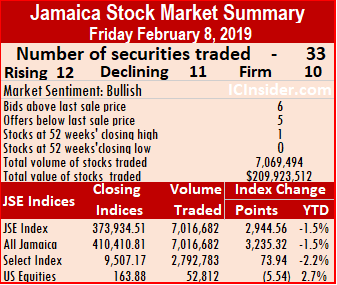 Trading on the main market of the Jamaica Stock Exchange ended on Friday with JSE All Jamaican Composite Index jumping 2,500.28 points to 417,412.66 and the JSE Index climbing by 2,275.58 points to 380,307.12. At the close market activity, the main and US markets traded 39 securities, compared to 32 securities trading on Wednesday, with 18 advanced, 13 declined and 8 traded firm. Main market activity ended with, 3,327,691 units valued at $215,403,267 changing hands, compared to 20,917,776 units valued at $2,473,285,188 on Thursday. 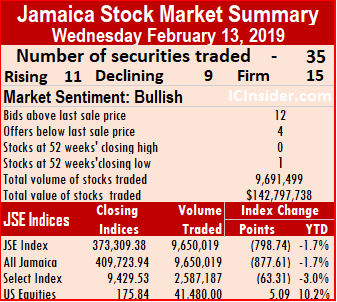 Eppley, Jamaica Stock Exchange and 138 Student Living preference share closed trading at 52 weeks highs but PanJam Investment traded at a 52 weeks’ intraday high of $82 but fell back by the close. 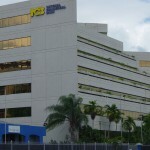 NCB Financial Group led trading for the second consecutive day with 1,062,496 shares for 32 percent of the day’s volume, Radio Jamaica was next with 672,252 shares, accounting for 20 percent of the total main market volume changing hands and Jamaica Broilers ended with 336,124 shares, for 10 percent of the day’s volume. IC bid-offer Indicator|The Investor’s Choice bid-offer indicator ended with the reading showing 9 stocks ending with bids higher than their last selling prices and 2 closing with lower offers. An average of 97,873 units valued at $6,335,390, in contrast to 674,767 shares valued at $79,783,393 on Thursday. The average volume and value for the month to date, amounts to 351,464 shares with a value of $16,773,070 and previously, 318,056 shares with a value of $9,511,657. Trading for January resulted in an average of 101,980 units, valued at $3,042,494, for each security traded. In main market activity, Barita Investments lost $1.10 in closing at $49.50 in trading 167,000 shares, Berger Paints fell 50 cents to end at $20, with 18,072 stock units trading, Caribbean Cement exchanged 40,126 shares with a loss of 50 cents, to end at $43. Eppley climbed $3.90 and ended trading of 1,000 shares, at a 52 weeks’ high of $13, Grace Kennedy traded 6,862 stock units with a gain of 50 cents to end at $58.50, Jamaica Producers rose 50 to close at $22.50, with 7,370 shares trading, Jamaica Stock Exchange ended at a 52 weeks’ closing high of $17.50, with 83,338 shares trading. JMMB Group lost $1.30 in trading of 19,904 shares at $31.70, Kingston Wharves rose $1 to close at $76, with 1,589 units changing hands, Mayberry Investments lost 85 cents and ended trading of 6,119 shares, at $8.05, 138 Student Living lost 30 cents trading 25,200 shares at $5.50. PanJam Investment fell 50 cents trading 19,320 units to close at $79.50 after hitting earlier a 52 weeks high of $82, Sagicor Group gained $1 and ended trading 53,548 stock units at $38.50, Salada Foods rose 50 cents trading 5,200 shares at $33. Scotia Group rose $1.99 trading 5,498 shares at $53.99, Stanley Motta shed 33 cents to end at $4.67, with an exchange of 2,000 shares, Sygnus Credit Investments dipped 50 cents to end at $11.50 with an exchange of 88,000 shares and Wisynco Group gained 35 cents and concluded trading of 43,108 shares at $11. Trading in the US dollar market resulted in 152,096 units valued at US$31,930 changing hands. JMMB Group 6% preference share concluded trading of 1,300 units at $1.04, Margaritaville traded 3,895 shares at 24 US cents, Proven Investments traded 129,301 units, with the price closing at 21.99 US cents, Sterling Investments trading 10,000 units to close at 4 us cents and Sygnus Credit Investments ended with 7,600 units trading at 11 US cents after falling 1 cent. The JSE USD Equities Index rose 0.33 points to close at 175.38. NCB Financial traded 16.55m shares on the JSE on Thursday. Gains in 15 stocks against 9 with losses sent the main market of the Jamaica Stock Exchange surging at the end of trading on Thursday. 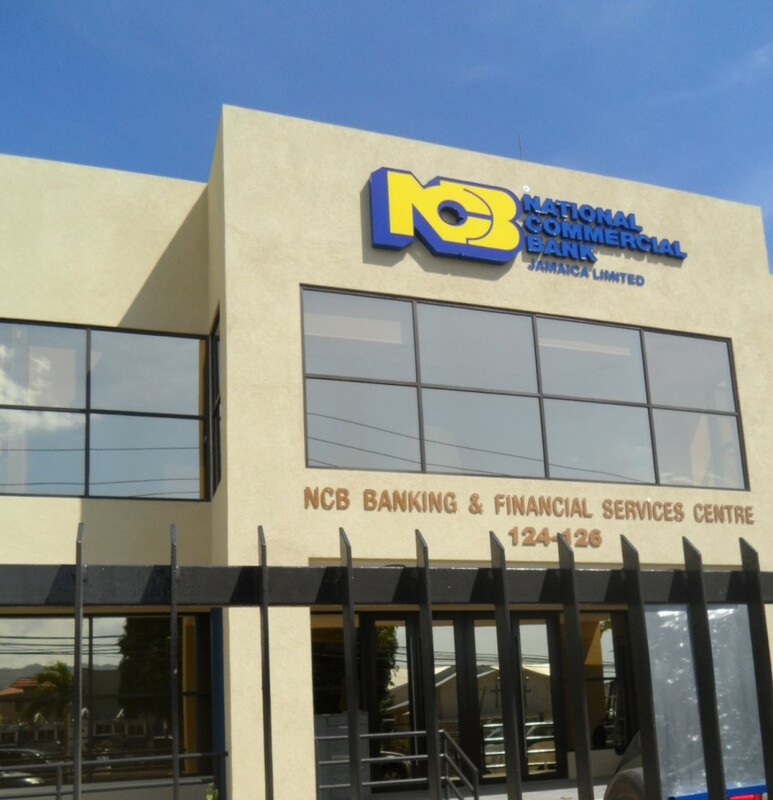 NCB Financial traded more than $16.5 million shares but had little impact on the indices. At the close, the JSE All Jamaican Composite Index jumped 5,188.44 points to 414,912.38 and the JSE Index surged 4,722.16 points to 378,031.54. 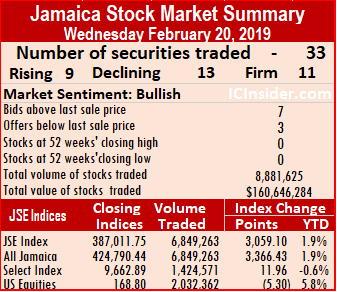 The main and US markets traded 32 securities, compared to 35 securities trading on Wednesday, with Jamaica Stock Exchange and Wisynco Group trading at 52 weeks intraday highs but PanJam Investments ended at a 52 weeks’ closing high as supply of the stock is very limited. Main market activity ended with, 20,917,776 units valued at $2,473,285,188 changing hands, compared to 9,650,019 valued at $141,880,042 on Wednesday. NCB Financial Group led trading with 16.55 million shares for 79 percent of the day’s volume, Wisynco Group was next with 1,492,528 shares, accounting for 7 percent of the total main market volume changing hands and Radio Jamaica ended with 944,409 shares, for 4.5 percent of the day’s volume. IC bid-offer Indicator|The Investor’s Choice bid-offer indicator ended with the reading showing 13 stocks ending with bids higher than their last selling prices and 3 closing with lower offers. An average of 674,767 units valued at $79,783,393 compared to 292,425 units valued at an average of $4,299,395 for each security traded, on Wednesday. The average volume and value for the month to date, amounts to 351,464 shares with a value of $16,773,070 and previously, 318,056 shares with a value of $9,511,657. Trading for January resulted in an average of 101,980 units, valued at $3,042,494, for each security traded. In main market activity, Barita Investments rose 60 cents to close at $50.60, in trading 4,169 shares, Berger Paints jumped $1 to end at $20.50, with 4,755 stock units trading, Caribbean Cement finished with a gain of 35 cents to end at $43.50, with an exchange of 9,975 shares. Grace Kennedy traded 82,237 stock units but lost $1.50 to end at $58, Jamaica Broilers finished trading 58,596 shares and lost 30 cents to end at $33.50, Jamaica Producers fell 41 to close at $22, with 26,953 shares trading, JMMB Group gained 25 cents in concluded trading of 408,504 shares at $33,. Kingston Wharves rose $4 to close at $75, with 23,515 units changing hands, 183 Student Living rose 80 cents trading 1,100 shares at $5.80. PanJam Investment jumped $4.99 in ending at a 52 weeks closing high of $80, trading 48,795 units, Sagicor Group gained 40 cents and ended trading 153,890 stock units at $37.50, Scotia Group added 75 cents trading 20,694 shares at $52, Stanley Motta gained 50 cents to end at $5, with an exchange of 31,684 shares. Sygnus Credit Investments rose $1.20 to end at $12 with an exchange of 41,700 shares, Victoria Mutual Investments rose 35 cents to settle at $4.05, with 30,867 shares changing hands and Wisynco Group fell 25 cents and concluded trading of 1,492,528 shares $10.65, after trading at a 52 weeks’ intraday high of $12. Trading over the past 4 days have significantly dried up supply of the stock. Trading in the US dollar market resulted in 36,975 units valued at US$8,057 changing hands with Proven Investments being the sole stock trading, with the price closing at 21.99 US cents. The JSE USD Equities Index fell 0.79 points to close at 175.05. Trading on the main market of the Jamaica Stock Exchange ended on Wednesday with the market indices and ending with more declines even as advancing stocks were more than declining ones. 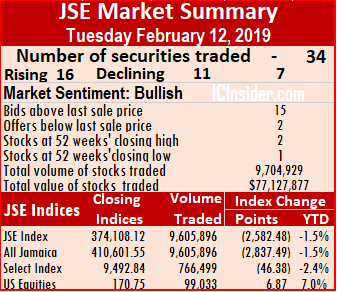 At the close of trading, the JSE All Jamaican Composite Index declined 877.61 points to 409,723.94 and the JSE Index lost 798.74 points to 373,309.38. The main and US markets traded a total of 35 securities, compared to 34 securities trading on Tuesday, with the prices of 11 rising, 9 declining and 15 remaining unchanged. JMMB Group 7% NC preference share closed at a 52 weeks’ low $1.98. 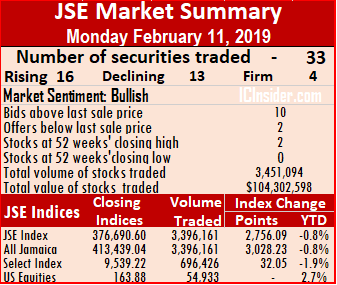 Main market activity ended with, 9,650,019 valued at $141,880,042, compared to 9,605,896 units valued at $71,284,670 changing hands, on Tuesday. Wisynco Group led trading with 3.3 million shares for 34 percent of the day’s volume, Radio Jamaica was next with 2,093,021 shares and accounting for 22 percent of the total main market volume changing hands and Jamaica Broilers with 1,959,403 shares, for 20 percent of the day’s volume and Jamaica Stock Exchange traded 1.16 million units. IC bid-offer Indicator|The Investor’s Choice bid-offer indicator ended with the reading showing 12 stocks ending with bids higher than their last selling prices and 4 closing with lower offers. An average of 292,425 units valued at an average of $4,299,395 compared to 300,184 units valued at an average of $2,227,646 for each security traded, on Tuesday. The average volume and value for the month to date, amounts to 318,056 shares with a value of $9,511,657 and previously, 321,224 shares with a value of $10,240,490. Trading for January resulted in an average of 101,980 units, valued at $3,042,494, for each security traded. In main market activity, Grace Kennedy traded 35,455 stock units and climbed $1.84 to end at $59.50, Jamaica Broilers finished trading 1,959,403 shares and rose 30 cents to end at $33.80, Kingston Wharves rose $1 to close at $71, with 1,192 units changing hands, 183 Student Living rose 99 cents and finished trading 5,000 shares at $5. PanJam Investment dropped $2.99 in closing at $75.01, trading 1,500 units, Sagicor Group fell $1.40 and ended trading 23,200 stock units at $37.10, Salada Foods traded just 18,495 shares, but lost $5.50 to close at $32.50. Stanley Motta fell 50 cents to end at $4.50, with an exchange of 1,616 shares, Supreme Ventures rose 45 cents and finished trading of 129,583 units at $19.80. Sygnus Credit Investments rose 75 cents to end at $11 with an exchange of 16,550 shares, Victoria Mutual Investments rose 35 cents to settle at $4.05, with 30,867 shares changing hands and Wisynco Group rose 40 cents and concluded trading of 3,318,014 shares $10.90. Trading in the US dollar market resulted in 41,480 units valued at $7,059 changing hands. Proven Investments traded 30,000 units at 22 US cents and Sterling Investments rose 2 cents in exchanging of 11,480 shares at 4 US cents. The JSE USD Equities Index advanced by 5.09 points to close at 175.84. 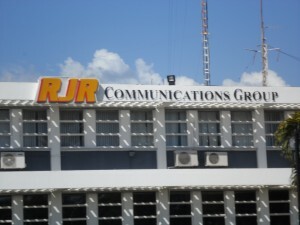 Radio Jamaica traded more than 4 million shares as the compnay posted strong gains in profit in the December quarter. 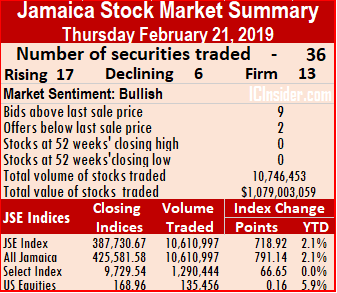 Trading on the main market of the Jamaica Stock Exchange ended on Tuesday with the market snapping two days of solid gains in the market indices and ending with big declines even as advancing stocks were more than declining ones. 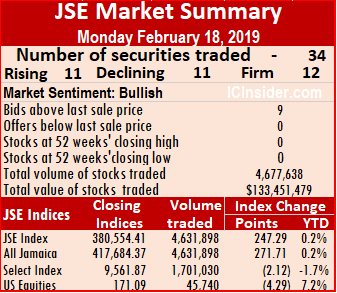 At the close of trading, the JSE All Jamaican Composite Index dropped by 2,837.49 points to 410,601.55 and the JSE Index dived by 2,582.48 points to 374,108.12. The main and US markets traded a total of 34 securities, compared to 33 securities trading on Monday, with the prices of 16 rising, 11 declining and 7 remaining unchanged. Three stocks traded at new highs during the trading session but only two ended at a new closing high and one closed at a 52 weeks’ low. Main market activity ended with, 9,605,896 units valued at $71,284,670 compared to 3,396,161 units valued at $104,302,598 changing hands, on Monday. Radio Jamaica led trading with 4,707,436 shares for 49 percent of the day’s volume, after the company posted strong gains in profit in the December quarter of $168 million versus $79 million in the similar period in 2017. JMMB Group 6% preference share was next with 1,799,538 shares and accounting for 18.7 percent of the total main market volume changing hands and 1834 Investments with 705,080 shares, for 7 percent of the day’s volume. IC bid-offer Indicator|The Investor’s Choice bid-offer indicator ended with the reading showing 15 stocks ending with bids higher than their last selling prices and 2 closing with lower offers. An average of 300,184 units valued at an average of $2,227,646 compared to 106,130 units valued at an average of $3,259,456 for each security traded, on Monday. The average volume and value for the month to date, amounts to 321,224 shares with a value of $10,240,490 and previously, 324,089 shares with a value of $11,497,407. Trading for January resulted in an average of 101,980 units, valued at $3,042,494, for each security traded. In main market activity, Berger Paints lost 50 cents and ended at $19.50, with an exchange of 6,803 stock units, Grace Kennedy traded with 88,962 stock units and lost 34 cents to end at $57.66, Jamaica Producers regained 50 cents to close at $23 in trading 6,008 shares. Jamaica Stock Exchange gained $1 and closed trading with 36,189 units changing hands, at a record close of $16, JMMB Group rose 65 cents and concluded trading 18,827 shares at $32.75, Kingston Wharves dropped $2 and settled at $70, with 44,616 units changing hands, 138 Student Living rose 49 cents and finished trading 1,199 shares at $4.01. PanJam Investment jumped $2.99 and ended at a 52 weeks’ closing high of $78, trading 6,262 units, Sagicor Group lost 35 cents and ended trading at $38.50, with 39,275 stock units, Salada Foods traded just 700 units, but lost 50 cents to close at $38, Scotia Group dropped $1.89 to finish trading 195,910 shares at $51.11. Seprod climbed $2.50 to finish trading of 695,712 shares at $39, Stanley Motta rose 30 cents to end at $5, with an exchange of 5,000 shares, Supreme Ventures rose 35 cents and finished trading of 12,668 units at $19.35. Sygnus Credit Investments rose 75 cents to end at $11 with an exchange of 16,550 shares and Victoria Mutual Investments lost 30 cents to settle at $3.70, with 236,520 shares changing hands. Trading in the US dollar market resulted in 99,033 units valued at over $11,543 changing hands. Proven Investments traded 6,633 units to close at 22 US cents and Sygnus Credit Investments rose by 2 cents in exchanging of 92,400 shares at 11 US cents. The JSE USD Equities Index advanced by 6.87 points to close at 170.75. 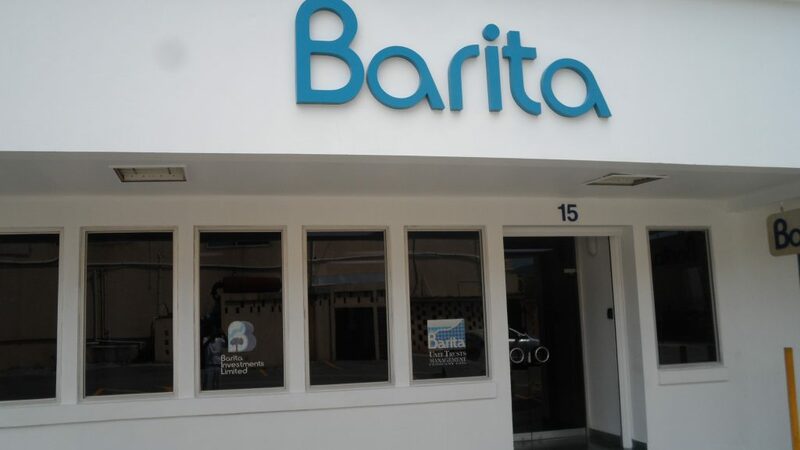 Barita Investments dominated trading with 1.1 milliobn shares changing hands. The main market of the Jamaica Stock Exchange closed on Monday with a second day of strong gains in the market indices with the prices of 16 rising, 13 declining and 4 remaining unchanged. 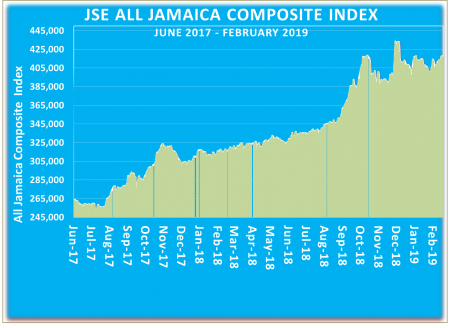 The JSE All Jamaican Composite Index jumped 3,028.23 points to close at 413,439.04 and the JSE Index climbed 2,756.09 points to close at 376,690.60 after both rose by more than 2,944 points on Friday. Importantly, NCB financial that played a big role in many of the big movements in recent months had little impact in Mondays move and suggesting that investors’ interest is more broad-based now than a few weeks ago. The main and US markets traded a total of 33 securities, compared to 31 securities trading on Friday. Main market activity ended with, 3,396,161 units valued at $104,302,598 changing hands, in contrast to 7,016,682 units valued at $207,252,597, on Friday. Barita Investments led trading with 1,113,243 units for 33 percent of the day’s volume, followed by Wisynco Group with 628,630 shares and accounting for 19 percent of the total main market volume changing hands and Seprod with 443,979 stock units for 13 percent of the day’s volume. IC bid-offer Indicator|The Investor’s Choice bid-offer indicator ended with the reading showing 10 stocks ending with bids higher than their last selling prices and 2 closing with lower offers. An average of 106,130 units valued at an average of $3,259,456 for each security traded, in contrast to 241,955 units valued at an average of $7,146,641 on Friday. The average volume and value for the month to date amounts to 324,089 shares with a value of $11,497,407 and previously, 358,447 units valued $13,030,049. Trading for January resulted in an average of 101,980 units, valued at $3,042,494, for each security traded. In main market activity, Barita Investments surprisingly, added 51 cents to close at $50.01, with the trading a large volume of 1,113,243 shares up to $52. Berger Paints gained 50 cents and ended at $20, with an exchange of a mere 100 stock units, Caribbean Cement rose 90 cents in trading 1,500 shares at $43, Jamaica Broilers climbed 50 cents in trading of 51,600 units, to close at 52 weeks’ closing high of $33.50. 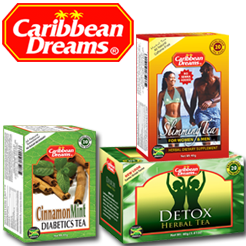 Jamaica Producers lost 50 cents to close at $22.50 and trading 6,000 shares, Jamaica Stock Exchange gained $1 and closed trading with 34,786 units changing hands, at a record close of $15, JMMB Group fell 70 cents concluded trading at $32.10, with 57,512 shares. 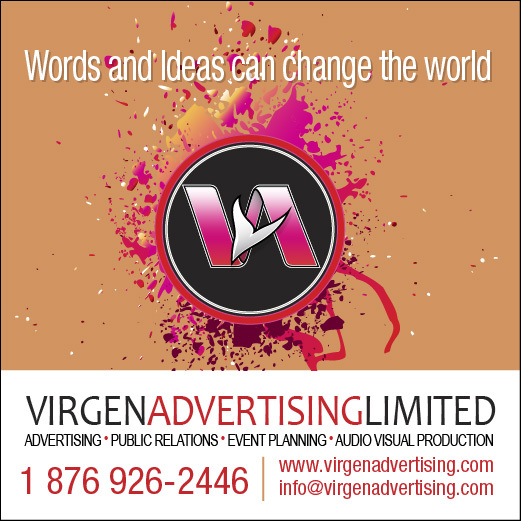 Kingston Wharves rose $3.48 cents and settled at $72, with 6,449 units changing hands, Pulse Investments traded 2,000 units and lost 50 cents to close at $2.70, Salada Foods traded 10,860 units, but lost 50 cents to close at $38.50. 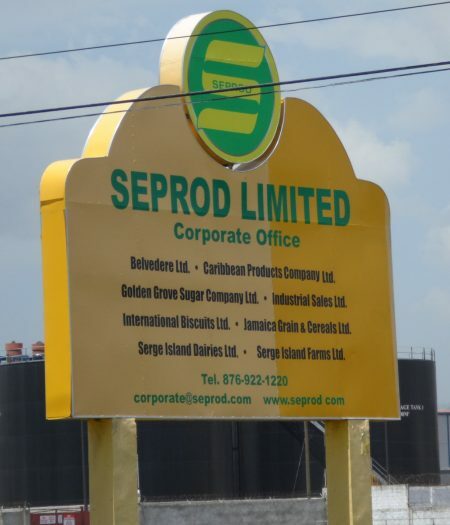 Seprod rose $1.65 to finish trading of 443,979 shares at $36.50, Supreme Ventures lost 80 cents and finished trading 42,611 units at $19 and Sygnus Credit Investments lost 90 cents to end at $10.25 with an exchange of 49,018 shares. Trading in the US dollar market resulted in 54,933 units valued at $57,130 changing hands as the sole stock trading, JMMB Group 6% preference share, lost 2 cents and concluded trading with 54,933 units at US$1.04. The JSE USD Equities Index closed at 163.88. 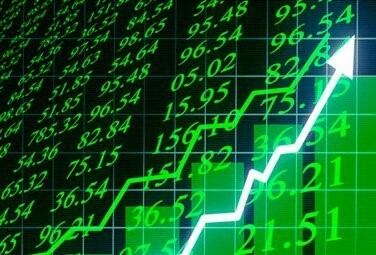 The main market of the Jamaica Stock Exchange enjoyed increased trading levels at the close on Friday over Thursday’s improved levels, leading the JSE All Jamaican Composite Index to jump 3,235.32 points to 410,410.81 and the JSE Index climbing by 2,944.56 points to 373,934.51. Main market activity ended with, 7,016,682 units valued at $207,252,597 changing hands, in contrast with 4,986,769 units valued at $74,552,633, on Thursday. The main and US markets traded a total of 33 securities, with prices of 13 rising, 9 declining with 9 remaining unchanged, compared to 31 securities trading on Thursday. Wisynco Group led trading with 2,688,897 units for 38 percent of the day’s volume, followed by Grace Kennedy, with 1,521,787 shares and accounting for 22 percent of the total main market volume changing hands and Sygnus Credit with 543,056 stock units for 8 percent of the day’s volume. An average of 241,955 units valued at an average of $7,146,641 for each security traded. In contrast to 184,695 units for an average of $2,761,209 on Thursday. The average volume and value for the month to date amounts to 358,447 units valued $13,030,049 and previously, 523,805 units valued $16,891,062. Trading for January resulted in an average of 101,980 units, valued at $3,042,494, for each security traded. In main market activity, Berger Paints lost $1.50 and ended at $19.50, with an exchange of 5,153 stock units, Jamaica Broilers climbed $4 in trading of 58,277 units, to close at $33, Jamaica Producers gained $1 to close at $23, trading 17,568 shares. Jamaica Stock Exchange closed trading with 81,864 units changing hands, with a rise of 5 cents to a record close of $14, Kingston Wharves lost 38 cents and settled at $68.52, with 266,720 units changing hands. Proven Investments traded 3,000 units and rose 50 cents to close at $27.50, Sagicor Group rose 25 cents in trading 25,424 stock units, to close at $38.80, Scotia Group fell 99 cents and finished trading of 489,552 shares at $53 and Sygnus Credit Investments lost 45 cents to end at $11.15 with an exchange of 543,056 shares. Trading in the US dollar market resulted in 52,812 units valued at over $10,639 changing hands. JMMB Group 6% preference share concluded trading at $1.06 with 218 units, JMMB Group 5.75% preference share closed at $2 trading 2,114 shares, Proven Investments traded 14,180 units to close at 22 US cents and Sygnus Credit Investments exchanged of 36,300 shares at 9 US cents. The JSE USD Equities Index fell 5.54 points to close at 163.88.